No Sibe should be left behind. We are here when they are. 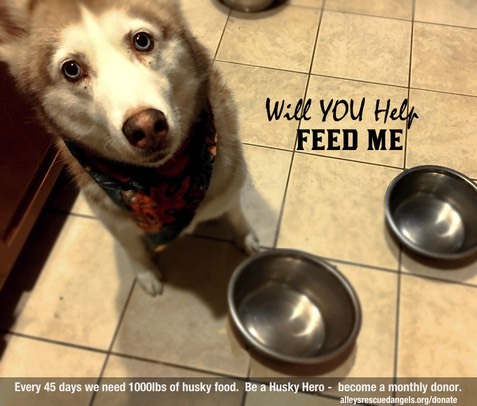 ARA Canine Rescue inc (Alleys Rescued Angels) is a 501(c)(3) non-profit, all volunteer, husky rescue organization based in Apple Valley, California. We have a 10 acre ranch where all of our rescued huskies have comfortable kennels and get plenty of socialization and playtime as they await their new families. We live with these dogs 24/7 and much of the day they can be found playing and running around our acreage. This helps them to become socialized and decompress from the trauma of the shelters or life on the streets. We are dedicated to saving the lives of abandoned Siberian Huskies throughout the counties of Los Angeles, Riverside and San Bernardino. There is a high demand for our help in other Southern California counties too. In recent months we have been swamped with people contacting us to surrender their huskies, if that is the reason for seeking us out then PLEASE read and follow this surrendering guideline about our requirements before contacting us. Approximately a quarter the dogs we save are medical dogs: the ones hit by cars, the injured and the sick. We rescue the blind dogs, the seniors, the ones that get looked past because they aren’t ‘perfect’. We rescue the most needy of cases because no Sibe should be left behind. We pay for vet care and operations and provide our rescued dogs with safety and love and a place to call home until their perfect match finds them. See videos of our ranch and the rescued huskies at play. We are top-rated charity with greatnonprofits.org for 2015, 2016, 2017 and 2018. We are a Heigl Foundation approved rescue partner, a Petco Foundation adoption partner, and a member of SHRR/CA and The No More Homeless Pets Network.